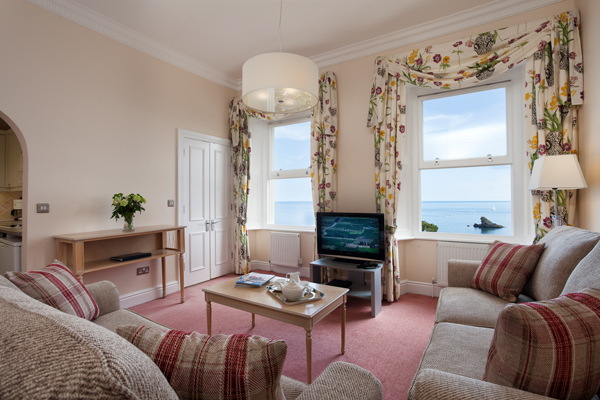 The Osborne Club has 45 elegantly furnished apartments, sleeping from 2 - 8 guests, all situated within the Crescent and most with panoramic sea views. There is also a Gate Lodge with its own private garden. The individually-styled apartments, which are inspected regularly by The English Tourist Board, provide comfortable living including flat-screen TV's, DVD players and free Wi-fi in each apartment. They also have daily onsite mangement and staff to assist with office, housekeeping or maintenance enquiries. 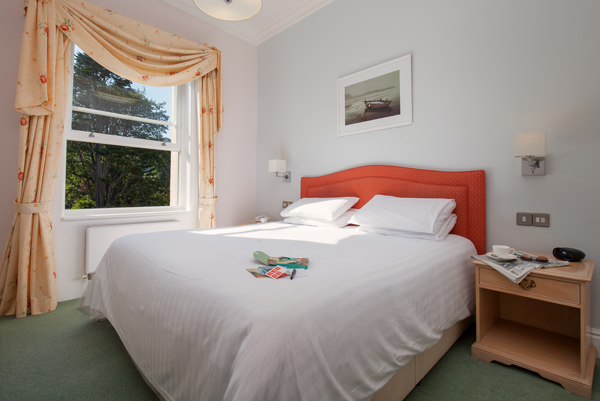 The Osborne Club share Hesketh Crescent with The Osborne Hotel and are able to provide unrivalled facilities. There is a weather permitted heated outdoor swimming pool and an indoor swimming pool & sauna available all year round. For the more energetic, we have a state-of-the art gym and an all-weather tennis court (charges may apply). There's also an outdoor play area for the little ones. 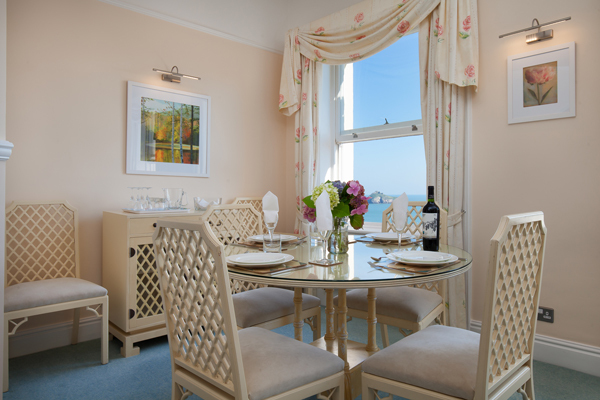 The perfect romantic fusion of Regency splendour and sea views! Apt. 8 on the 2nd floor in House No. 1 Hesketh Crescent offers 2 bedrooms, lounge sofa bed, bathroom, cloakroom and large living area with the added luxury of lift access on arrival to the half landing. The spacious living, dining & kitchen areas measures 15ft x 23ft and offer fabulous sea views from the 3 large Victorian windows which overlook the crescent grounds and the wonderful 180∞ bay views can be enjoyed from both a seating & standing position! Sleeps up to 6 & check-in on Friday's. A newly appointed & furnished 2nd floor apartment in House No. 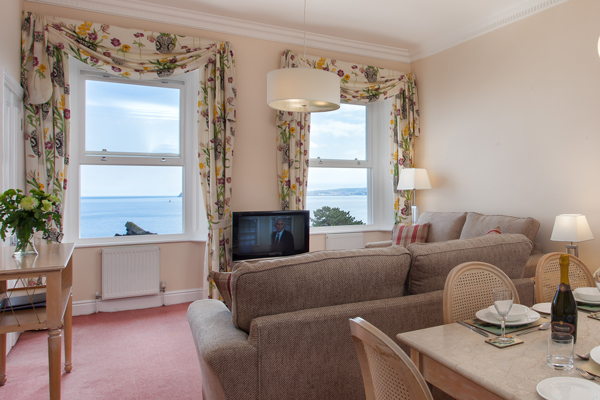 5 with 2 bedrooms & stunning sea views from the lounge & study windows. Ease of access is by way of an elevator taking you to the half landing. The lounge, dining room & kitchen areas measure 19ft x 13.5ft with a sofa bed also in the lounge. There are two bright & spacious bedrooms, a bathroom and cloakroom plus a sea view study room with day bed for 1 guest off the lounge. Sleeps up to 6 with the use of the sofa bed in the lounge for a further guest. Discovery Holiday Homes is a decidedly different kind of rental agency! We offer a very friendly, flexible & efficient online holiday home booking service not only in Devon but throughout the world.